Producido desde 1935 hasta 1938 en Checoslovaquia. 202 de estos vehículos fueron apropiados por la Wehrmacht y usados durante tres años. In the game, the tank is one of the two light tank choices available to the player after the Leichttraktor. Unlike the Pz.Kpfw. II, this tank has the option of using either a cannon or an auto-cannon. While not as fast or maneuverable in its stock configuration as the Pz.Kpfw. II and possessing 5mm thinner frontal armor, it starts off with the 3.7 cm KwK 34 (t) L/40 cannon. Later, it offers the player a choice of an upgraded version of this cannon; the 3.7cm KwK 38(t) L/47, or the 2 cm Flak 38 L/112 auto-cannon, which combines moderate damage and penetration with a high rate of fire. A further advantage is the choice of an up-powered 220hp engine, which vastly improves its speed and handling characteristics. With the upgraded turret mounted, this tank becomes very effective in hull down positions, due to the heavier front armor of the turret. First either upgrade to the 3.7 cm KwK 38 (t) L/47 gun or the 2 cm Flak 38 L/112 auto-cannon. Next upgrade to the much improved Skoda T-15 engine. Then upgrade the turret and the suspension. Between the wars, the new Czech nation maintained an advanced defence industry with a production capability extending to light and medium tanks. In 1935 and 1936, Skoda’s LT (Light Tank) vz. 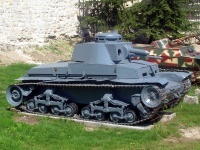 (model) 35 entered service in small numbers, and by 1937, it was the main tank of the Czech Army. The LT-35 was comparable to other European tanks in service at the time, such as the Polish 7TP, British Vickers 6-ton, Soviet T-26, Italian Carro Armato M 11/39 and M13/40, and German PzKpfw III tanks. The LT-35 equipped four fast divisions of the Czech Army as of 1938. During its service with the Czech Army, the LT-35 gained a reputation as an unreliable vehicle and was considered to be an "interim solution" before the LT-38. Eventually, the PzKpfw 38(t) would be fully developed and ready for production. 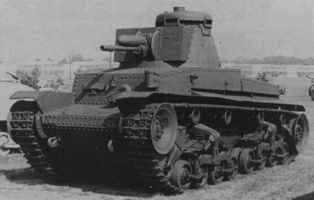 The LT-35’s reputation of being unreliable was due to its untested advanced technical design, but in 1938, its problems were solved and the LT-35 proved to be a good tank. LT-35s were produced in different variants and were also known under different designations such as the R-2 and T-11. 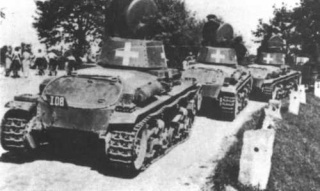 Before the war, LT-35s were also sold to Romania (126 tanks were sold in 1936 and were designated the by Romanian Army as the R-2). 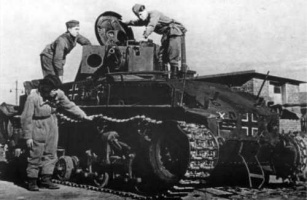 The 1938/1939 German take-over of the Czechoslovakian state resulted in the confiscation of 219-244 LT-35s from the Czech Army, and subsequently, incorporated into the German Army in March 1939. Some 79 remained in service with the Slovak Army’s 3rd Fast Division, which saw service alongside the Germans on the Eastern Front. 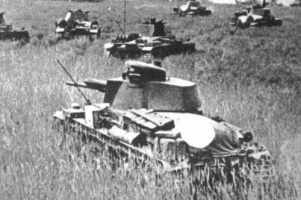 In German service, LT vz.35s were designated as Panzerkampfwagen 35(t)s (t for Tschechisch, or Czech). LT-35s taken over by the Germans were fitted with FuG 5 (10-watt transmitter/receiver) and FuG 2 (receiver) radio equipment. Germans also added a fourth crew member to act as a loader, increasing the rate of fire. The LT-35 was comparable to the German PzKpfw III and was an important addition to the Panzerwaffe. Despite a Czech decision to phase the LT-35 out of production after 1938, production was extended until 1939, under the German supervision at the CKD (Ceskomoravska Kolben Danek) Works in Prague and Skoda Works in Pilsen (after 1938 both became part of Reichswerke Hermann Goring). Overall, 424 units were produced between 1935 and 1939 by Skoda (approximately 340) and CKD (approximately 84). The PzKpfw 35(t) formed the bulk of the 1st Leichte (Light) Division during the Polish Campaign, and then of the 6th Panzer Division (former 1st Leichte Division) during the French Campaign and the Invasion of the Soviet Union.